Living room with 1/2 bathroom and interior dinning room and kitchen with all Viking appliances. Cable and WiFi included. Daily housekeeping is included (cooking and cleaning) in rental fee, from 9:00 am to 5:00 pm. The project has a private beach with bars and a restaurant, a beach front spa, children playground, 3 swimming pools, snorkeling, scuba diving, kayaking and paddle surf center. Games available (pool table, ping pong, fusball). Very secure project where kids can roam free. I live in the capital but have been coming to this area since I was a child, my husband and I come as often as possible and would like to set permanent residence here. This condo is on a luxurious vacation property with great surroundings, views and very private beach. It is very secluded but with every confort available to you. 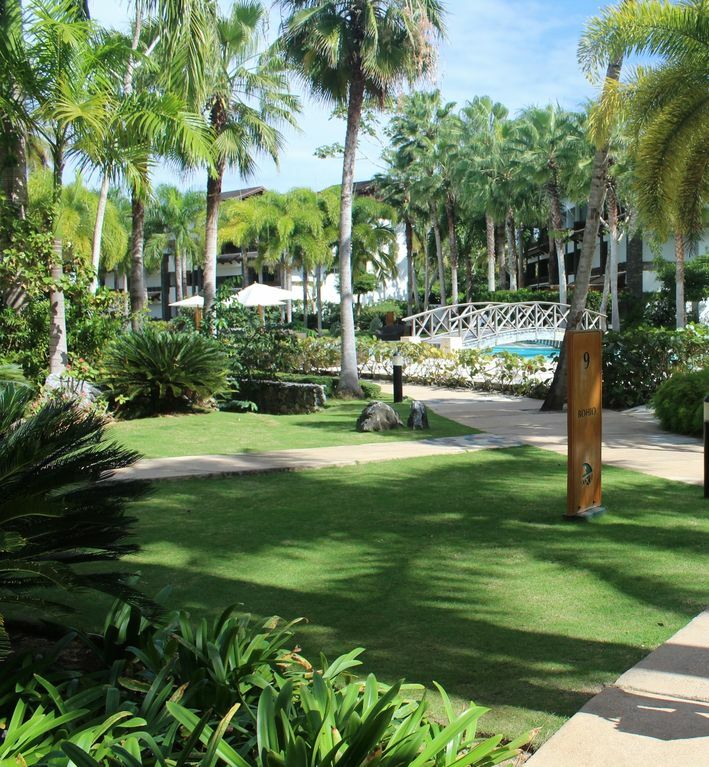 Balcones del Atlántico resort has a relaxed policy of 'simple luxury,' providing service as needed when requested. This property has all the conveniences of a self-service apartment with the perks of hotel service, very peaceful which is rare among family friendly resorts. The area is very pristine and a popular destination in this part of the country, it is surrounded by white sandy beaches and in a town that has it all, with a charming mixed community that makes you feel welcome. Laundry hamper provided Blow dryer, towels, ammenities such as shampoo, conditioner, soap and lotion included. The project is beachfront although the unit is not, which is great for noise! Only a 2 minute walk from the unit. Hi speed WiFi Service contract through local company "Claro", we are not responsible for company"s system failure. 1 main dinning room inside, 2 extra dinning areas outside, 1 out on the deck next to the hot tub. Service contract through local company "Claro", we are not responsible for company"s system failure. Sand building toys and snorkeling gear available. 3 Communal pools, 1 with playing ground for children. Housekeeper included in rate, covering cleaning and cooking (groceries not included) Internet/Cable Services contract through local company "Claro", we are not responsible for company"s system failure. Rosa’s home was the perfect retreat for my first family trip since giving birth to my first son. The condo is clean, modern, spacious and had everything we needed for a perfect family getaway. The complex is spacious with plenty of pools and walking distance to the beach, and very safe. Chela was a wonderful host who indulged me in all of my favorite Dominican dishes. We cannot wait to visit again! We spent four nights at Rosa’s beautiful spot. The home was clean, the beds were comfortable and the outside living area was spectacular! The grounds were well kept and the amenities as promised. Rosa was very helpful and responsive. Thanks for a wonderful experience! Thank you for being a perfect guest, glad you had a great time and welcome back anytime! Our family of four stayed at Rosa's home over winter break. The home is well-appointed, and property overall is well-managed. My kids loved the hot tub after a long swim, and the convenience of the pristine beach steps away, can't be beat. Thank you Jenny, you have a lovely family, glad that you had a good time and welcome back anytime. Rosa was a great host. Booking, arrival as well as daily housekeeping by Chela made this stay very easy and relaxing. Close enough to town, but far enough away to enjoy both the city as well as privacy. Great private beach area as well as restaurant at the beach to enjoy the sunset. This is a great rental for those needing space or a larger family. The facilities/pool/overall grounds are showing a bit of wear and prob need a bit of reinvestment by the property managers/developers to keep pace with rental rates. Thank you for your review, it was a pleasure to host you. I will send the maintenance message to the property managing office, I know they are in process of taking care of these issues in the short future. We were so please with this home and the whole property of Balcones Del Atlantico! It is more beautiful in person and the grounds are meticulously groomed with various lush trees and plants. It is a gated community with friendly security staff who secure the property 24/7, which is nice, since it is in an area with no neighboring communities. It is so peaceful and we really, really enjoyed all the outdoor living space. It is located in the back of the property, which is a bit of a haul to the beach, but set back so you can't hear the road noise. We always felt safe and completly at ease. Cheyla was so special to have every day to cook if you prefer or just clean up, which is a nice treat while on vacation. Although she only speaks Spanish, we had fun trying to communicate our needs and learn some Spanish, she is wonderful and cooks fabulous meals! We had rented a car and drove from Santa Domingo and were pleasantly surprised at how good the highway was, however the local drivers on motorbikes were a bit hectic and you defintely have to drive with care! The Porto restaurant was fantastic, but a bit pricey, and we found this to be the best of the 3 restaurants we chose in town. Great seafood! We were happy to have this since there is nothing else within walking distance. The unit itself is very comfortable and we liked the decor and furniture and it felt very upscale. The whole resort was very luxurious, and we also enjoyed the pools. Lovely to have just outside of our unit. Las Terrenes itself is VERY busy and not much to be desired. We were quite happy to stay put in our peaceful environment for the week. The beach is quite beautiful, but it was very windy every day, but we found a spot on the other side of the Porto restaurant that was a lot calmer. We really couldn't believe how much of the beach was so underpopulated, loads of room to have to yourself, and just relax. We would definitely come back to this unit and resort!! So much to love about it! Thank you Rosa!! I am so glad you had a great vacation, you were perfect guests and are welcome anytime! My family and I had the pleasure of spending Christmas at Rosa's villa. We loved everything about our stay, the villa was clean, organized and looked exactly as it is shown in pictures. We had everything we needed and enjoyed the quiet, home away from home feel. The housekeeper Chela was very nice and accommodating, she made our stay even more comfortable. The grounds around the villa were green, lush and well kept. The area is quiet and tucked away from the city center, so there are not many restaurants or nightlife close by. I would recommend renting a quad or car to get around. At night it is a ghost town and very dark, but also safe there were always security guards everywhere. This is a very family friendly area, my kids enjoyed the play area on the beach and the big pools in the common area. Rosa was an excellent host, she was always available and provided us with all the information we needed for our stay. I would highly recommend this villa to families looking to enjoy a fun and peaceful vacation. I can't wait to visit again! Thank you and I am glad you enjoyed it, you were a perfect guest, welcome anytime! The Samaná peninsula, where the beachfront town of Las Terrenas is located, is a hot spot for natural beauty, a contrast between raw and refined. With its tropical forest and beach combination, I believe this undiscovered paradise will be a pleasant surprise for many. On top of it, Las Terrenas town has wonderful and affordable places to eat. I recommend Le Tres Caravelle, La Yuca Caliente, Casa Azul and La Terrase, or have an amazing coffee with pastries at La Boulangerie. Unique beach bars are just steps from the water in Las Terrenas. Also worth visiting is 'Pueblo de pescadores' (former fisherman's village), a strip of open air restaurants and trendy bars bordering a boardwalk along the coastline. Make time to visit the 170 ft waterfall El Limón, the zip line, go whale watching, or rent a 4 wheeler/Quad and discover the many other beaches in the area. The town is charming and full of Dominican culture, with good shopping for local handcrafted items and a vibrant nightlife with a very mixed population where transplants to Samaná have enthusiastically mixed with resident Dominicans. -NO EXTRA FEE for cleaning and cooking, service is INCLUDED in rate. (Groceries are not included, must be provided by you) -No re-rented permitted. -Payment must be completed in full 21 days before arrival. -In order to follow security protocols from the property management’s office, I need you to provide me with the names of everyone in your party and the ID of the person in charge of the reservation; they will be checked at the main entrance gate at your arrival. Send this following completion of your booking. Also please inform me the estimated time you plan to get there, so the housekeeper is there to greet you and hand in your keys. If you will arrive past 6:00 pm please let me know in advance. .